Have gotten a little behind with pictures and reports in May It has been incredible. 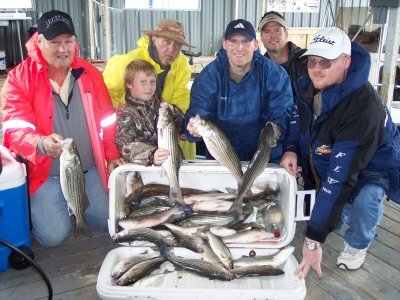 Loads of fun, catching lots of fish; good large stripers, with plenty of fight. Leaving the docks at 6:30am and sometimes back fast with 40-50- and yes 60 fish, by 8am. This does not include the number of fish caught and released, before bait runs out. Plenty of happy people, large groups, all limiting, with their promises to return soon. Names like Gabennnesch. Hoehman, Adair, McGarrah, Mechanical Paetners, Nuckols, Murphy, Prestonwood, etc. Can't get any better than this, even with the high water, and rains during the period. God is good. "JD"